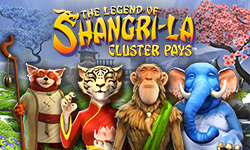 The Legend of Shangri-La: Cluster Pays is the next installment in NetEnts Cluster Pays series. This time, the wise monk accompanies you on the path to enlightenment. However, be careful of the dragon spirit on the mountain! It does not take trespassers lightly. With the monk by your side, together you will prevail. The Legend of Shangri-La Cluster Pays is a 6 reels and Cluster Pays payouts by NetEnt. Features here include; Substitution symbols, a Random Substitutions feature, a Sticky Re-Spins feature, a Free Spins feature, cluster wins and more. There's a chance to win almost 1,000x your total bet on each spin. This game is available on mobile, desktop and tablet for stakes starting from 10p to £200 a spin. The Legend of Shangri-La Cluster Pays has great visuals. This oriental themed slot takes players to a tranquil fictional mountain with the accompaniment of a monk. Cherry blossoms and green valleys make up the background with symbols on the reels including butterflies, dragonflies, flowers, koi carp and a cat, monkey and elephant that represent 3 guru symbols. The guru symbols usually appear as stacked. The cat pays the highest value of 1,000x your total bet when 30 or more land on the reels. This means players will form a win when a cluster of 9 or more symbols is formed. The game also has a Substitution Symbol which turns into the adjacent symbol for all symbols except the Free Spins symbol. Random Substitutions feature -The Random Substitutions feature is activated when at least 2 matching symbol clusters land in the main game. The clusters must have 4 of the same symbol in each. When it is triggered, 1 Substitution symbol is added onto the reels. Sticky Re-Spins feature -This feature is activated 2 or more non-winning clusters with matching symbols appear on the reels. The symbols stick in place while the others keep re-spinning. The re-spins keep on going until no more new sticky symbols land. Free Spins feature -The free spins are activated when 3 or more Free Spin symbols appear on the reels. 3, 4, 5 or 6 free spin symbols will pay you 5, 6, 7 or 8 free spins respectively. If you land 2 Free Spin symbols, you will trigger the Nudge Reel feature where you can land the 3rd Free Spin symbol. It can be nudged back onto the reels and activates the Free Spins feature. Once the spin starts, random Substitution symbols are added and eliminated on every free spin. These help spinners form winning combos. If you can win under 10x your total bet, you'll win from an additional free spin. The Legend of Shangri-La Cluster Pays online slot looks great and can pay out up to 1,000x your bet on every spin or free spin. You’re more likely to win big from the Substitution symbols in the main game and in the bonus spins. Overall this is a medium variance slot, a superb online slot by NetEnt.